This will be the final post in the series on using Wild Ginger’s PatternMaster software to edit my pants pattern. I’m currently making a wearable muslin based on the pattern, but I’ll save that for my next article. (You can see sneak peeks of my progress on my Instagram feed). As I noted last time, the pants are still too snug at the widest part of the hip. 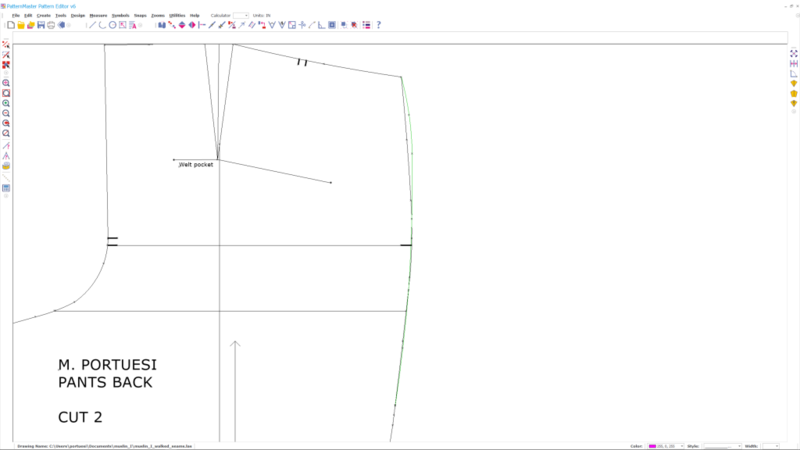 It is easy to draw a new curve to widen the side seams in Pattern Editor. This was a bit of guesswork, not having the hip curve from a physical ruler to trace against. I just tried to draft a nice curve that would add to the seam. I also took the opportunity to smooth out a kink in the old side seam, right where you see the notch in the screen shots below. The green curves show the new side seam line. This entry was posted in Pattern Alteration, Pattern Drafting, Trousers and tagged wild-ginger on September 27, 2015 by mportuesisf. A lot has happened with my pants project since my last update – more than I can cover in a single blog article. Today, I want to cover some of the more advanced things I’ve been doing on the computer with Wild Ginger’s PatternMaster. But I also want to get back to working with fabric. Walking and truing seams is an important part of patternmaking; you want to make sure that matching seams are the same length unless you’re intentionally doing so, in order to shape the garment in some way. 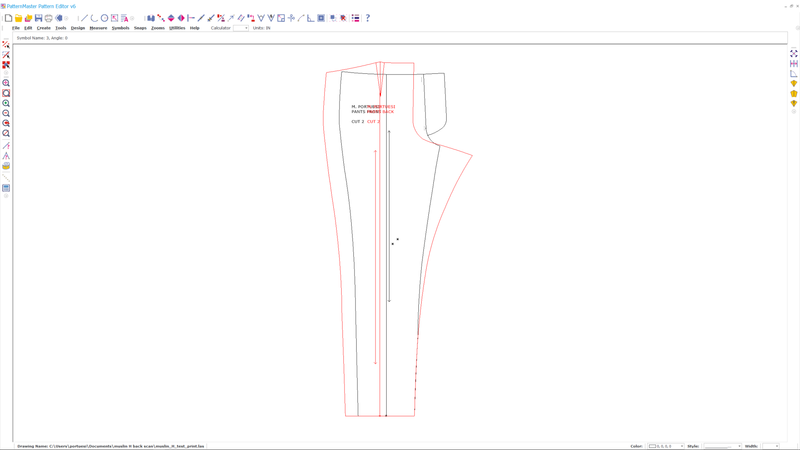 Wild Ginger’s Pattern Editor makes it easy to compare two seams; if you select the lines and curves that make up a seam, it will tell you how long the seam is, and it even has a tool that will compare two seam lines and tell you the difference between the two. You can also use Pattern Editor to simulate the way you would walk seams on paper. (You can click/tap to see closeup versions of all the screenshots). I started by flipping the back pants piece (in red outline) left-to-right using the Mirror command, then used the Align command to align it with the front piece at the bottom inseam. This entry was posted in Pattern Alteration, Pattern Drafting, Trousers and tagged wild-ginger on September 13, 2015 by mportuesisf.